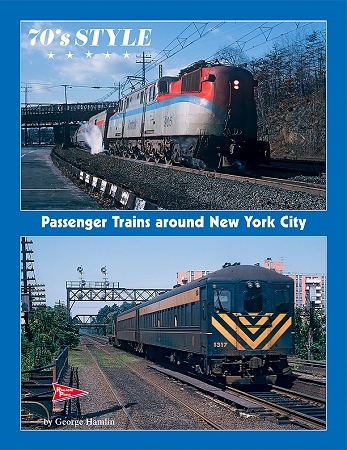 "70's Style -- Passenger Trains around New York City" by George Hamlin is an all-color look at passenger railroading in the metropolitan New York region in the 1970’s -- a fascinating era of transition, blending relics from the turn of the century with modern Turboliners built by a company that manufactured jet engines, and everything in between. We’ll start our tour on the former New York Central Harlem line and make our way around the area, visiting the neighboring Hudson line, the New Haven, Jersey Central, Pennsy (including the jointly-owned tracks of the NY&LB at South Amboy) and end up on the Erie Lackawanna, glimpsing both the former Erie and D&LW lines. So sit back and enjoy the view as we take a trip back in time!